1 family pack = 10€ ! 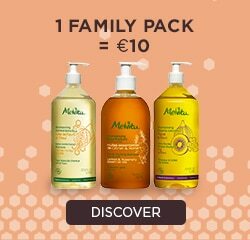 You'll love our family packs at only €10 when you spend €35 or more. A more eco-friendly and cost-effective alternative ! Take a more environmentally-friendly approach. ► A pack of 3 cotton pads, not only organic but reusable too! A small step for your skin but a big step for the planet! Want to move over to organic? ► ...plus 3 free samples! What’s more… delivery is free!